No position on the rugby field is more closely identified with the idea of creativity than the number 10 – outside-half, or first five-eighth, depending upon which part of the rugby world you come from. As a boy growing up in Wales, the number 10 jersey was the most coveted in the schoolyard. Everybody wanted to be Barry John or Phil Bennett, but there could be only one. Most had to be content with being Delme Thomas or Bobby Windsor instead. If the notion of creativity can be summarized in one word, that word would be ‘vision’. The number 10 has to be able to see the attacking possibilities unfolding on the pitch a few seconds before they happen. He has to be able to see the geometry of the offence in relation to the defence, communicate his findings to the players around him, and handle the ball accurately – and he has to do all of those things in the fractions of a moment. Vision can be improved, and ‘Vision training’ is fast becoming a must-have at the elite end of sport. One of the best-know vision trainers in Rugby is Dr. Sherylle Calder, who worked with two successive World Cup winners in England (2003) and South Africa four years later. Perhaps it is no coincidence that one of Calder’s favourite ex-students is Jonny Wilkinson, the England number 10. 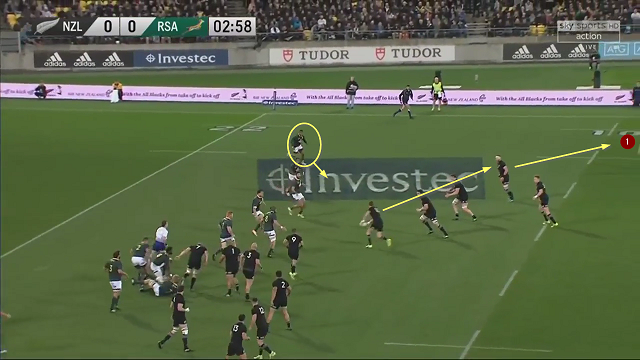 Better peripheral awareness and depth perception lead to better decision-making, and from this perspective Beauden Barrett’s game in the recent match between New Zealand and South Africa in Wellington was of interest from start to finish. 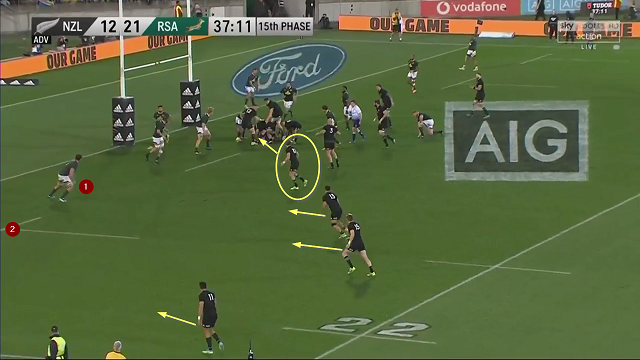 The All Blacks have won a quick ball and created a temporary 6 to 4 overlap out on the right. 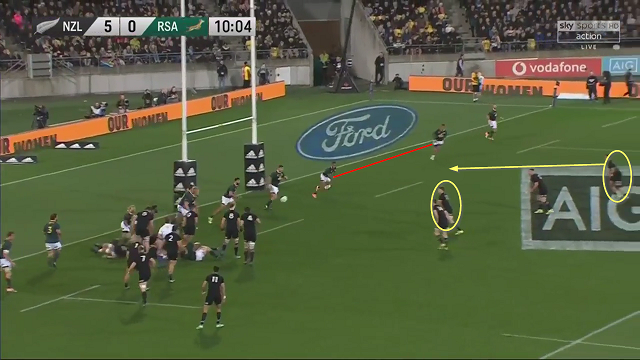 At the critical moment there is the opportunity for Barrett to pass across the front of the two forwards closest to him and hit Kieran Read, who can then connect with the wing (Ben Smith) out of shot in the “1” position. This option is also made more attractive by the tendency of the South African left wing (Aphiwe Dyantyi) to jam in hard, leaving the space to the outside free, but Barrett doesn’t see it. Lukhanyo Am comes up, Dyantyi jams in and Barrett has no time to do anything but manufacture an offload to Ben Smith. With Handre Pollard right on top of him, Barrett only has time to pick the ball up off his bootlaces and flip it on in one movement – and his hand/eye coordination can do that superbly well. Springbok number 7 Pieter-Steph du Toit flies up on the outside and forces Barrett to ‘see’ the right option, a short pass to prop Karl Tuinukuafe which puts him into the hole that has been created. The gap between Am and Dyantyi is an inviting 10 metres wide, and Lienert-Brown begins his angled run straight towards it, scenting the chance. But Barrett doesn’t see it quickly enough, and the opportunity goes a-begging. Summary Beauden Barrett’s status as the incumbent All Black number 10 and World Player of the Year can mask the complex questions he raises about the nature of creativity on a rugby field. His stupendous athletic gifts and ability to react quickly in tight situations create a huge number of opportunities for the teams in which he plays to score. Nobody does it better. But as soon as the perspective widens and he is required to pick a pass, using the width of the field and choosing from a number of options, the ‘vision’ is much less sure-footed. As Sherylle Calder would say, ‘the visual system is giving him information too slowly or inaccurately’. For the All Blacks coaching staff, it is a fascinating issue to have to resolve in one of the very best players on the face of the planet.